I’m at the London Toy Fair at the Kensington Olympia. It’s my first time at such a vast trade show, the biggest event in the annual calendar for those in the toy industry. I’ve travelled up to London on a day of freezing mist, and arrive into the Hall wrapped up in a thick coat and scarf. I soon warm up as I walk the endless rows of booths. My every step feels watched by suited and coiffured sales people waiting for me to pause by their stall so they can engage me in conversation. My initial thought is that most of what I’m seeing on show will end up in landfill within about 8 months from purchase. “It’s interesting to me that when we talk about play today, the first thing that comes to mind are toys. Whereas when I think of play in the 19th century, I would think of activity rather than an object”. I am remembering how happy I was, as a child, to play for hours with a duffel bag full of wooden bricks, a few cars and a few other bits and bobs. I built cities, temples, other worlds. They were alive to me, and at the end of the day, whole realms went back into that duffel bag. Most of what is on view here fails on one, or multiple counts. I’ll share a few highlights. There’s a display of ‘Peek-a-Boo’, fluffy doe-eyed teddy things. “I hold your tablet!” announces a card each one is holding, adding “and clean your screen”. No idea how, but apparently they do. For me, any child young enough to be attracted to such a thing probably ought not have much access to a tablet anyway. There’s a box containing ‘Chocolate Sprinkle Stix’, offering the opportunity to “make your own Chocolate Sprinkle Stix!”, which looked like a chocolate-covered stick coated in hundreds and thousands. There are some hideous Disney dolls houses and all manner of toy ranges tied into upcoming films, whether Star Wars, Minions or various others. There were whole stands dedicated to ‘educational’ and ‘nature’ toys, each designed to do a very specific thing, plastic magnifying glasses for looking at things you find, worm farms and so on, and a “Creepy Crawly Catcher” which looks like any creepy crawly it caught wouldn’t come out of the whole arrangement with all of the limbs it went in with. There are troublingly over-sexualised dolls for very young girls, called ‘Top Model’. All the rage this year are some horrible things called Megasaurs ‘Grow Eggs’. You put an egg in water, and over time it turns into a baby dinosaur that grows and grows into a then, presumably, rather useless slimy dinosaur thing the size of a football. Which you then throw away. That’s it. I was transfixed by a short video that was playing to promote a cuddly doll whose name now escapes me. It showed a girl sitting with her dog (real dog). The dog farts, but it’s ok because this is no ordinary cuddly toy, it’s scented to smell of cookies! So, when faced with the aroma of her dog, she was able, instead of perhaps opening the window, as presumably would have happened before, to reach for what, in effect, is a cuddly air freshener, exposing the child to who knows what chemical cocktails. A week before the Toy Fair, I had read in the paper that researchers were suggesting that the human attention span had now, for the first time, fallen to less than that of goldfish. Quite how one would work out such a thing I don’t know, but it struck me that most of the toys on view here are designed for a young generation with short attention spans. Things that beep and flash and do one particular thing, to be picked up, played with, put down again and, within a short time, discarded. There were few things on sale here that would sustain the imagination, hold the attention for prolonged period of time, apart from perhaps Lego, and construction toys of that ilk. Spiegel has written of the commercialisation and co-option of child’s play as being “a trend which began to shrink the size of children’s imaginative space”. I had come to the Toy Fair in search of one particular toy, one that has been accused of being a particularly prominent offender. The toy in question is ‘Hello Barbie’. Boog sets out a series of concerns around the technology of the doll, including the potential for hackers to access the doll, and the mining of data about your child. “These are valid concerns”, he writes, “but I am most worried about how this doll hacks straight into my daughters imagination – it could easily kill her family of imaginary friends”. But search as I might, Hello Barbie was missing from the London Toy Fair this year. She’s still on sale though, although only in the US, where she retails for £195. I was actually quite disappointed not to meet her. Also not present at the Toy Fair, but for sale in UK, is ‘My Friend Cayla’, distributed by The Vivid Toy Group. The BBC recently reported concerns that the doll can be hacked, and can reveal personal data about your child. In Germany, the Federal Network Agency, who oversee telecommunications, have advised parents to destroy the doll. Although the UK Toy Retailers Association have stated that the doll “offers no special risk”, concerns are growing about this new kind of toy. To get a taste of how toys have changed, I then headed to the Victoria and Albert Museum of Childhood. Housed in Bethnal Green, their collection of toys throughout the ages is impressive, including their current exhibition of board games. One thing that struck me was how toys reflect our cultural values back to our children. 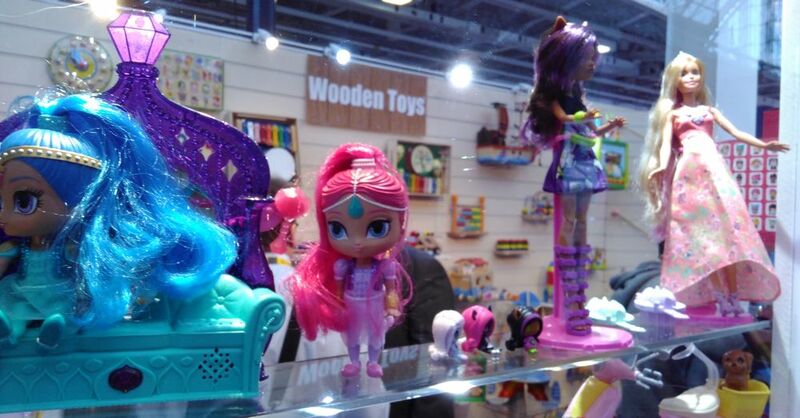 Many of the toys at the Toy Fair promote the idea of children as isolation, individual consumers, rather than play as a collaborative experience. They, in the case of ‘Top Model’, promote a sexualised concern about body image, whereas older toys taught more about decorum and manners. Older toys were designed to be done for long periods of time, board games that, frankly, would bore modern children rigid. How many toys on show at the London Toy Fair would encourage the generations to play together in the way captured in this Victorian painting? Many of the toys were designed to be things you took outside to play. I had an Action Man (GI Joe in the US) which I loved, but he was designed to be thrown around in the mud, abseiled off trees, snorkelled in ponds, parachuted off tall buildings. Of course there were also things to do inside, but over the last 30 years or so, parents have become more concerned about safety, and more people live in cities and flats with no gardens or access to safe outside space, so toys have changed to reflect that. Lots of what was on view at the Childhood Museum were the toys of the wealthy. Most children had little other than their imaginations (play as “an activity rather than an object”), and perhaps a doll, some bricks, and other kids to play with. You have to feel deep sympathy for the increasing number of kids constantly ferried from place to place, from activity to activity. Gone are the days of “can Johnny come out to play?”, instead children are growing up in a world of pre-arranged play dates. Gone are the days of hanging out with friends swapping jokes, instead kids message each other links to funny YouTube videos. Gone are the days of big board games that families all played together, instead as parents become more and more time-poor, toys are designed to distract, to babysit. “the great joy of play is that for a time, we are utterly spontaneous, in a state of pure being, no thought is unthinkable, no image is unimaginable”. Here in the Toy Museum were toys that were open-ended, which promoted interaction, collaboration and conversation, and which could be use for simple or elaborate pretending. Toy theatres where you could create your own scenery and character and imagine your own plays. Amazing puppets. Invitations to be imaginative, creative, playful. Things to do on a rainy afternoon that didn’t need wifi or batteries. That weren’t trying to sell you something else. What message does this, spotted at the London Toy Fair, pass on to kids about our food system? I wondered, as I passed the Pokemon stall, the plastic pizza you could cut up with a plastic knife, and the latest movie tie-in range, how much that was housed under the vast roof of the Kensington Olympia and on its way to toy shops across the country had much chance of putting anyone into “a state of pure being”. Perhaps I’m setting the bar a bit high, but hey, why not? Hi Rob. Your post reminded me of one of my favorite books. “Momo” by Michael Ende. There is a scene where Momo is given a talking doll with a mountain of different outfits and accessories. Momo has absolutely no idea how to play with it. The doll keeps saying “My name is Bibi, I want more things”. Most toys today are exactly that: endless collections of accessories, that have no other function than to quench the thirst to own more stuff. Hi Rob I share your concerns about the deadening of children’s imaginations. As a grandmother, I’m apalled by modern toys. Even play dough comes with shaped cutters. My 3 year old grand daughter was amazed to see me shape her play dough into animals. Many board games are rampantly capitalist with tasks such as collecting brand names and acquiring wealth. The dress up box no longer seems to exist having been replaced by endless Disney must-have outfits. Rather than being designed for short attention spans I believe many toys are designed to create short attention spans as this supports the buying of more ‘stuff’. On a different note I have noticed a change in the songs sung by me and my children. Gone are the rhythmic songs, replaced by Disney songs that build to a deafening and frenzied crescendo that leave children in a state of high tension. This cannot be healthy or in the best interests of our future society.